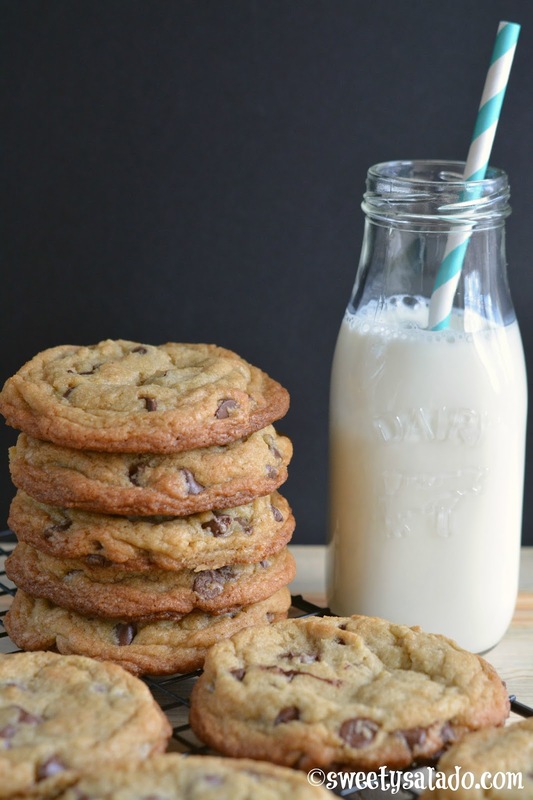 Making cookies during the holidays is a big tradition here in the US and chocolate chip cookies are always a must. Everybody loves them! And I hear they’re Santa’s favorite but based on the size of his belly, I’m sure he likes them all. These cookies are pretty much made with a standard recipe unless you want to change the texture. 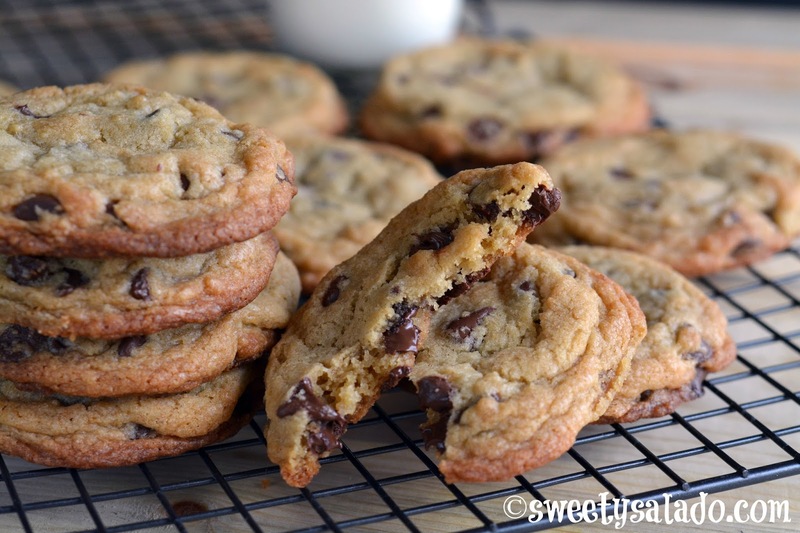 Some people like them thin and crunchy, others like them with a cake like texture, others like them super small and I love them big and with tons of chocolate chips. You can also add nuts and white chocolate if you want. The one piece of advice I do want to give you is to measure the flour correctly so you they come out with great texture. The best way to do it is to use an 8 oz measuring cup, fill it with flour using a spoon and then level it off with a knife. I know that bakers swear by using a food scale to measure everything but trust me, I’ve been making these cookies this way for years and they always come out perfectly. In a medium bowl mix the four, salt and baking soda. Set aside. In a large mixing bowl cream the butter, brown sugar and white sugar. Add the first egg and mix well. Then add the second egg with the vanilla and mix again. Scrape the inside of the bowl to make sure everything is well incorporated. Add the flour and mix it with the spatula until you get a smooth dough. 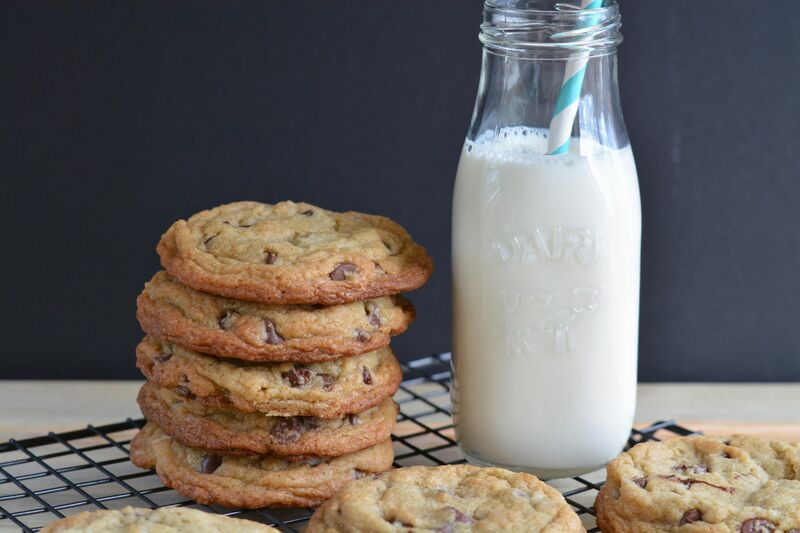 Now add the chocolate chips and mix well to incorporate them. Cover the bowl with plastic wrap and refrigerate for 2 hours. Pre-heat over at 375ºF (190ºC). After 2 hours form your cookies with the help of an ice cream scoop or two spoons and place them on a baking sheet covered with parchment paper or a silicone mat. Make sure to leave a space of about 2 inches (5 cm) between each cookie and bake them for 10-14 minutes or until the edges are golden brown. Take them out of the oven and let them rest on the baking sheet for 5 minutes, then place them on a cooling rack to let them cool completely. If you want to freeze them, place the formed cookies on a baking sheet covered with parchment paper. You don't need to leave a big gap between them. Cover the baking sheet with plastic wrap and place it in the freezer. Once the cookies are frozen you can wrap each one with plastic wrap and store them in the freezer inside a resealable bag. Once you're ready to bake them, you can follow the instruction found on step #4.